Torco Accelerator, Unleaded Race Fuel Concentrate, Case of 6 x 32 oz. Description: Due to shipping hazardous requirements, we are only able to ship Torco to the lower 48 states by GROUND. The Unleaded concentrate when blended with a 93-octane super unleaded makes up to a 107-octane race fuel for many of today's race cars, streetcars, motorcycles, watercraft, ATV's, and many other motor sport applications! Great for two and four cycle engines. Accelerator works as well as any performance unleaded fuel within the limits of compression and RPM's per application. 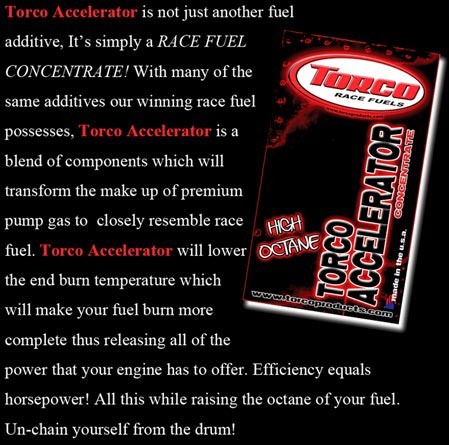 Torco markets Accelerator as a race fuel concentrate. Before discussing this product, lets first address key differences between a racing fuel and pump fuel. The obvious one is octane. Under the US octane rating system AKI (Anti-Knock Index) pump fuel is graded as (RON+MON)/2. Meaning if a fuel had a RON (Research Octane Number) of 96, and a MON ( Motor Octane Number) of 90 its AKI would be 93. Race fuels can be graded on any of the standards AKI, MON, RON. So what is octane and why is it important? Octane is what gives gasoline its ability to resist pre-ignition. As displacement, compression, boost, RPM, go up it becomes harder to keep the fuel mixture from igniting prematurely. If under load or high heat, you experience knock with 87 octane, stepping up to 91 octane is logical step for both performance and longevity. If you experience no knock or timing pull at 91 there is no benefit to you stepping up to 93 or higher. The additives that raise octane have less energy than the base fuel, effectively lowering the BTUs of the fuel. That is you will make the most power and have the best fuel economy with the lowest octane that is capable of preventing knock under your specific conditions. Another major distinction between race and pump fuel is RVP (Reid Vapor Pressure). The easiest, overly simplified, way to think of RVP is as a scale to rate the tendency for the fuel to want to evaporate. In general racing fuels have a much lower RVP than would be found in pump fuel due to the poor starting characteristics that come along with low RVP fuels. Burn speed is another major difference. Race fuels are blended towards a specific application. The desired burn rate in a Kart at 16k RPM is very different than the target burn rate of something like a big block V8 at 9k RPM. Too fast of a burn and you may experience less than optimum power. Too slow and your exhaust valves may be opening before maximum pressure is reached. Without going into specific gravity, dielectric constant, and numerous other variables, you should now have a basic understanding that there is a lot more to fuel than just octane. Altering these variables randomly can serve to be counter productive. For the purpose of objectivity lets look at one of the most common indicators. Price Includes an addtioanl Special Hazard Handling Charge of $12.95 per case for HZMAT fees.